We'll use the Penny Arcade ingame chat channel to organise things. I just realized I've never used the SC2 chat features at all. How does this work? @Gabriel_Pitt it's been too long since I joined a channel to talk you through it without being ingame, so I'll figure it out closer to the time. is that still our channel? Geth, roll 1d7 for MMM/Gabe! Geth, roll 1d7 for me and SorC. And the first PA SC2 tournament in years comes to a close! Congrats to Vari for an undefeated run, and congrats to @Gabriel_Pitt for being a worthy opponent, even knowing they were outclassed going into it, put up a fight in every game. Ya that was fun! Congrats to @Variable !! I also got to sneak in an AI game while I waited for the next match. definitely gonna be playing more this week because of this and I'm looking forward to watching those finals next week. yay starcraft! tonight was really nice, thanks Dhal for putting it together and everyone for coming out to play! Lessons I learned - don't forget to close the front door when fighting protoss, because that's how you get DTs all up in. IF you do forget to close the front door, and you have turrets up to discourage oracles, and you 'meh' that you have time to get marines out because you have scans... make sure you DID'T forget to upgrade to orbital command. Anybody watching GSL / King of the Hill tomorrow morning? I'm only watching gsl live if I can stay up. We'll see. Def will watch the vods asap otherwise, likely tomorrow afternoon. I've been watching the Shoutcraft tourny rerun and messing around vs the AI. 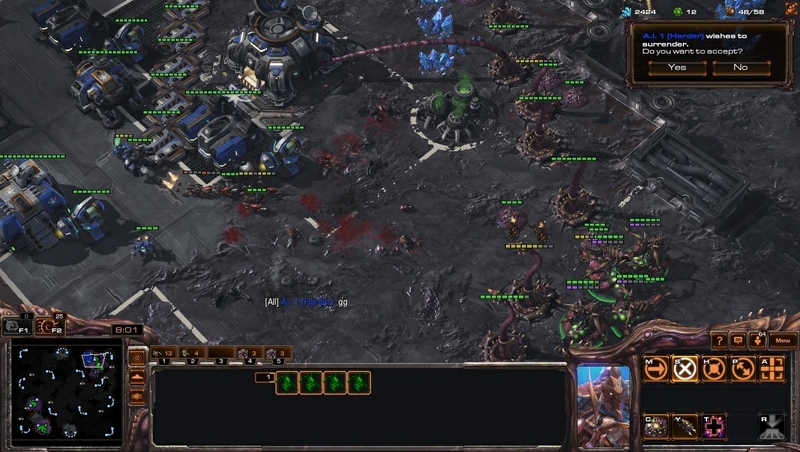 The LotV units make me feel like sc2 is more "open" in terms of cool strategies than when I last played. Lots of cool unit combinations. Ya? Curious as to why you agree. My opinion is just based on "hey this seems like there is alot of possibilities" but not any thing else. i yolod into my placement matches even though ive havent played sc in forever. i went 1-4 and it put me in gold?! Are there just so few people playing that getting one win puts you in gold? It blows my mind. I figured i should be down in bronze/silver since i barely even know what im doing. my one win was very satisfying though. My opponent scouted that i was starting to mass mutalisks and he built a bunch of vikings and some turrets. so i quickly switched to hydras/roaches and he just didnt have the right units to stop it. Also, sometimes your one win is where the system says, "Ah ok, this is probably approximately where they belong"
i just havent played a single game against another person since like the launch of the zerg campaign and i dont think i even finished my placement matches. before that i was platinum in WoL after grinding it a bit. but im nowhere near as good now. my apm was like 50. Does anyone know when the Brood War remake is coming out?